Members of the Socialist Party, previously known as Militant, etc, are proud of the principle of Internationalism. It is our political belief that socialism cannot be achieved in one country on its own. Even the largest, successful socialist oprganisation would come under immense international pressure from capitalism, pressure on economic, political and eventually military fronts. 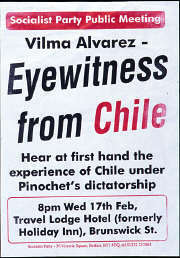 As a part of our international campaigning work we have supported marxists in other states, hence we held the public meeting in Belfast with a Chilian comrade speaking to highlight the lessons of the Military coup. To read about the coup there are 2 articles on the main Socialist Party site. 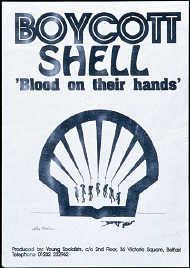 The other poster shown here is also very relevant as it was against the involement of the Shell petrol-chemical company in the blatant death of a civil rights activist. As a part of this we erected posters in Belfast calling for a boycott of the Shell garages to put economic pressure on them, posters which were supported by leaflets outside garages.